"What do they want?" "God help you…" Paramount has debuted the official full-length trailer for Darren Aronofsky's new film titled Mother!, or actually correctly mother!, without any capitalization. This looks super creepy and mysterious and dark, which is not what I was expecting at all, but damn does it still look thrilling as hell. Jennifer Lawrence and Javier Bardem star as a couple whose relationship is "tested" when uninvited guests arrive at their secluded home. The full cast includes Ed Harris, Michelle Pfeiffer, Domhnall Gleeson, Brian Gleeson, Stephen McHattie, Kristen Wiig, and Stefan Simchowitz. With a score by Jóhann Jóhannsson. This looks like it is reminiscent of Shutter Island and a few other psychological horror thrillers, all with Aronofsky's unique touches and incredibly powerful performances. 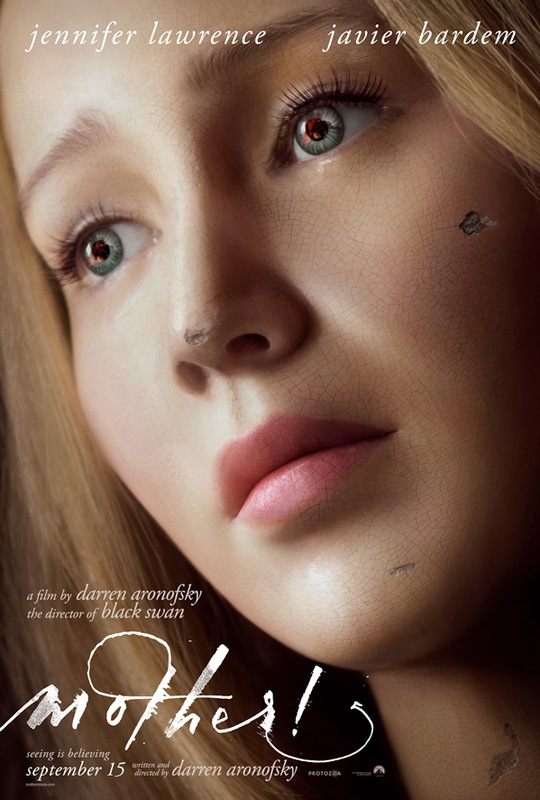 For more info & updates, follow @MotherMovie. Or you can also follow Darren directly @DarrenAronofsky. Centers on a couple (Jennifer Lawrence & Javier Bardem) whose relationship is tested when uninvited guests arrive at their home, disrupting their tranquil existence. Mother! is both written and directed by acclaimed American filmmaker Darren Aronofsky, of the films Pi, Requiem for a Dream, The Fountain, The Wrestler, Black Swan, and Noah previously. The film is also produced by Aronofsky, as well as his producing partners Scott Franklin and Ari Handel. Paramount Pictures will release Aronofsky's Mother! in theaters starting September 15th coming up in the fall. This will first premiere at the Venice and Toronto Film Festivals before heading to theaters. For more updates on the film, follow @MotherMovie. Thoughts?